From its name alone, you will probably figure out that this WGS Technology game is actually based on the Jack and the Beanstalk fairy-tale. The Lucky Beans slot features cartoony icons, 5 reels and 20 paylines to bet on, and contains a non-progressive jackpot which could see you win up to 5,000 coins. That’s a fine height to aim at. The Lucky Beans slot machine has plenty of appropriate graphics littering its reels. 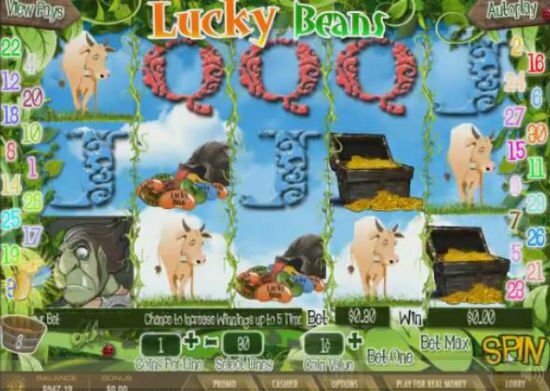 As you might imagine, most of the Lucky Bean slot graphics include imagery such as cows, geese, beans, giants and, of course, a little boy – we’ll call him Jack. All of the reels are submerged in twine (the beanstalk), of which this slot’s theme is based. 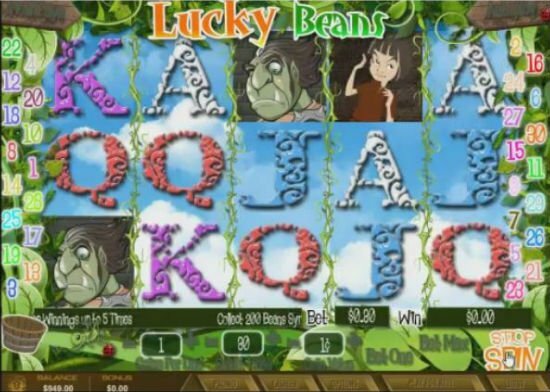 Underneath the mass of leaves in the Lucky Beans game is a wagering menu bar. From there, players can opt to choose coin values of 1p up to £5. The cheapest stake in the game is just a penny a pop. We can also tell you in this Lucky Beans slot review, that the most expensive wager is £450 per spin. 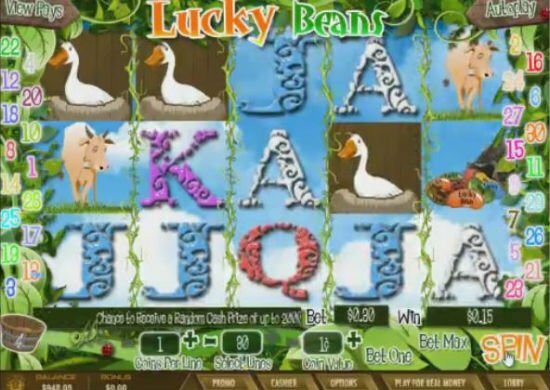 Lucky Beans slot bonuses are quite numerous, and have played an important part in determining just how successful this video slot has gone on to be. Without them, this would just be another Jack and the Beanstalk themed game. Our little Jack is the wild icon. When you play the Lucky Beans slot, you will quickly learn that. He can substitute for every other symbol in the game, but not scatters. The wild icon is also the best paying symbol in the game, which is good to know if you’re hunting down that jackpot. Randomly triggered bonuses are present in the Lucky Beans slot. After essentially any spin, you could pocket multiplied cash prizes of between 5x and 200x your total bet. Expanding wild reels can also appear on the first and third reels, which will again boost your chances of success in the Lucky Beans slot machine. Should you locate two scatter symbols, one on the second reel, and one of the fourth, then you will trigger a free spins bonus. The amount of free spins you get is random. The expanding wilds feature may appear randomly in the free spins bonus, but the other randomly triggered feature will not be accessible. A second bonus is also included in the game. This Lucky Beans feature is a basic pick and win game, where you could win further cash prizes. The Lucky Beans slot is a fantastic ride, if you can manage to find a place to play it. It is quite rare, although identifying a casino offering WGS software would be a start. Everybody thinks that Net Ent’s Jack and the Beanstalk slot is the definitive game with this theme. We beg to differ. It may be a mite simpler, but the Lucky Beans video slot is just as rewarding as its more popular cousin.